After five generations of rear-wheel-drive M5s, BMW’s heavy-hitting sport sedan will drive all four wheels for the first time ever for 2018. The new model is quicker and more powerful, but it is also more refined than the car it replaces. 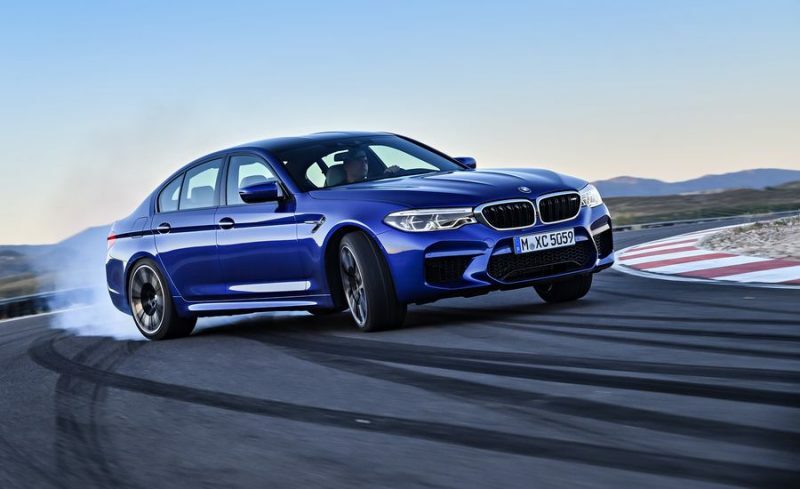 The 2018 BMW M5 gets the latest version of the automaker’s twin-turbo 4.4-liter V-8 tuned to 600 hp and 553 lb-ft of torque, up 40 hp and 53 lb-ft from the last-gen M5. Peak power is reached between 5,700-6,600 rpm, and peak torque is available from 1,800-5,700 rpm. The improvements are achieved in part because of redesigned twin-scroll turbochargers capable of delivering 24.46 psi of boost. Injection pressure has also been raised from 200 bar to 350 bar for a more efficient burn. Additionally, the lubrication and cooling systems have been redesigned, and the cross-bank exhaust manifolds have been optimized for more even exhaust pulses to the turbos. The engine is mated to a performance-oriented eight-speed automatic transmission. 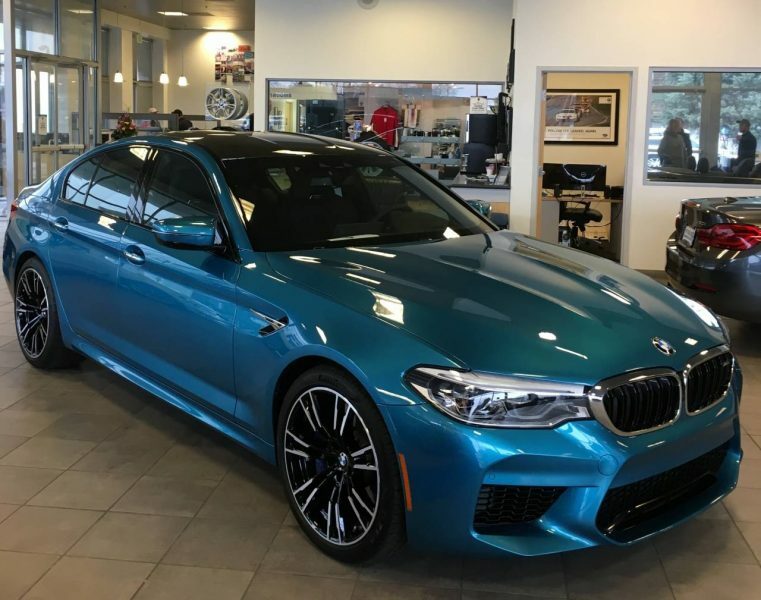 BMW estimates that the 2018 M5 can hit 60 mph from a standstill in 3.2 seconds and 124 mph in 11.1 seconds. Top speed is capped at 189 mph when equipped with the optional M Driver’s Package. But the big news is the M5’s new M xDrive all-wheel-drive system with two-wheel-drive mode. The system defaults to all-wheel drive with Dynamic Stability Control (DSC) turned on, but a rear-biased 2WD mode with no DSC is selectable. In this mode, the front wheels are only powered when traction is limited and the rear wheels can’t effectively put the power down by themselves. All other times, the transfer case routes all power to the rear, and the Active M Differential manages torque between the rear wheels. To find out what we think of this setup, read technical director Frank Markus’ M5 prototype drive. BMW’s M Division had a good starting point in the G30-generation 5 Series, but a number of changes were made to the M5’s chassis. The double-A-arm front suspension and five-link rear suspension have been revised, and the track has been widened for better directional stability. The M5 gets thicker anti-roll bars and stiffer rubber mounts, along with a new steel X-brace. An available Variable Damper Control system adds electronically controlled shocks with three modes, and an available speed-sensitive M Servotronic Steering system gives drivers more options to adjust steering effort. The M5 rides on standard 19-inch wheels fitted with 275/40s in the front and 285/40s in the rear. A set of 20-inch alloys wrapped in 275/35s in front and 285/35 in back is available. M compound brakes come standard and clamp down on perforated, vented 15.5-inch steel rotors in the front and 15-inch discs in the rear. Blue-painted six-piston front brake calipers emblazoned with the M logo are also standard. If that’s not enough stopping power for you, M carbon ceramic brakes with gold-finished calipers and larger front rotors are available. This option reduces unsprung weight by 50.7 pounds, according to BMW. Other weight-saving measures include a weight-optimized active exhaust, an aluminum hood, and a roof that uses carbon-fiber-reinforced plastic (CFRP). If you’ve seen the new 5 Series’ interior, then you’ve seen 90 percent of the M5’s interior, too. 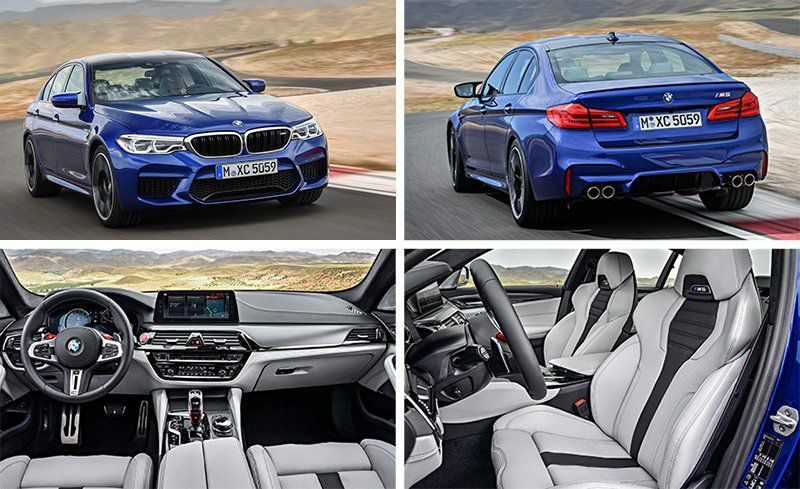 The M5 receives heated M Multifunction front seats with illuminated M5 logos and thicker side bolsters, an M Sports Steering Wheel, a red ignition switch, and red accents on the gear selector and paddle shifters. Like the 5 Series, the M5 features a wide central screen with gesture control. The M5 does get a unique head-up display that can project a shift light and other performance data in the driver’s line of sight, however. For a short time, Peterson BMW, will have our first BMW M5 on the showroom floor. Although, it is already sold we are lucky enough to be able to keep it on our showroom for a little bit. 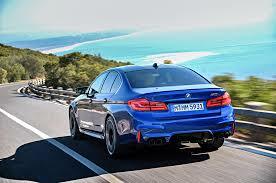 If you see a M5 in your future let us know and we can let you know when this one will land. Even though you can’t drive it, you can LOOK at this amazing vehicle and decide if this is the right BMW for you. Article by Alex Nishimoto for Motortrend.